Thank you for your consideration of our cattle. 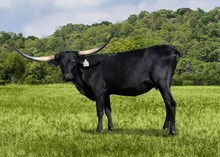 We consign cattle to many major longhorn sales. We also sell a number of our cattle through private treaty, on-site ranch visits. Please take time to view all our cattle.... If you see any that you are interested in, please don't hesitate in contacting us with any questions that you might have. From time to time, we can even arrange shipping if you do not have a way of getting them home to your ranch. To hold young calves for a new home, we require 1/2 down and then 1/2 at pickup. At the time of pickup, all our cattle are fully vaccinated, dewormed and will be registered through the TLBAA to their new home. Nice, big bodied bull. Will be fertility and trich tested prior to leaving for new home. Beautiful, full bodied longhorn. Confirmed bred at this time and ready for a new home anytime.. Gorgeous in person! Blount Pasture. Very nice mature cow. Great udder, loving mother. Tons of horn and great temperament. Confirmed bred to TKR Tuff Blitz at this time. Very, very nice cow! Beautiful cow! Large bodied, great horns for her age. Very calm and easy going. Excellent mother! Confirmed bred and ready for a new home anytime! Beautiful Cowboy Chex daughter. Will be confirmed bred to Spartacus when she leaves for a new home. Very calm and easy going! Blount Pasture. Beautiful roan cow out of great genetics. She is a sweet, easy going cow that is a great milker. Will be confirmed bred at the time she leaves for a new home. Beautiful tricolor cow! Colorful and sweet. Will be confirmed bred before going to a new home. Really gorgeous in person! Beautiful tricolor beauty. Very nice temperament. Own daughter of Pail! Larger framed, lots of total horn. Confirmed bred at this time and ready for a new home anytime. Bellview Pasture. Hunts breeding all over her pedigree. This is a sweet, young cow with a ton of potential! Great producer with great genetics. Confirmed bred to Peacemaker at this time! Very nice four year old. Confirmed bred to the amazing Santee Chex. Gentle and raises a good calf every year. Ready for a new home anytime! A beautiful heifer calf born 3/2/19. Heifer out of Pearl Snap BCB! Good deep bodied female with great horn growth! Just as sweet as can be. All offspring are Millennium Futurity eligible. Good milker!! Can be sold as a pair for $2250 or we can keep and rebreed her and she'd be available after calf is weaned in the fall. Very calm and easy going cow. Excellent mother! She projects to 77" and has some great genetics like JP Grand Unbluffed, Wyoming Warpaint and RM Whirlwind WR 7/7. Has a small bull calf at side now and can go as a pair for $1950 or we'll keep her until the calf is weaned and she's rebred. Your choice! Beautiful solid dun big bodied cow with a lot of horn. Easy to work and handle, great disposition. Raises a big calf every year. Has a new heifer calf and can go as a pair for $2500. Otherwise, she'll be rebred when she leaves. We love this cow! Atterbury Pasture. Nice young cow. Thick bodied and beautiful! Easy to work! Excellent mother. Will be confirmed bred to TKR Tuff Blitz when she leaves for her new home. Beautiful young cow. Calm and easy going. Confirmed bred now and ready for a new home anytime! Beautful Malachi daughter-she's solid black. Horns are really coming on now-you'll like her! Raises a wonderful calf. Will be confirmed bred at the time that she leaves. Bellview Pasture. Beautiful cow that will be confirmed bred when she leaves for a new home. Great temperament with a good bad. Raises a beautiful calf! Really quality breeding here! Nice bodied young cow. Confirmed bred to Spartacus at this time. Beautiful young cow. Great disposition and raises a great calf. Will be confirmed bred when she leaves for a new home. Really nice, flat horned heifer that has a great pedigree.Has a new bull calf by an outstanding 20 Gauge/Pacific Mermaid bull. Ready for a new home anytime! Pedigree includes WS Jamakizm/Coach on top, plus Delta Vixen/Starlight/Tari Graves FM49 on bottom.Can be sold as a pair for $1950 or you can wait until her calf is weaned later this year and she'll be confirmed rebred for another calf. Your choice! Beuatiful grulla and white cow! Excellent mother. Very calm and easy going. Has a 3/22/19 bull calf at side now and can go as a pair for $1950 or can stay here and be rebred and will go as bred cow. Your choice! Beautiful Marin Luther daughter! Solid black beauty that is confirmed bred now and ready to go anytime! Really quality breeding-very marketable and desirable! Bellview Pasture. Her mother is 86"TTT and her father is the great Kobra bull. She is very easy-going. Her horns are slowly twisting and beautiful. Confirmed bred now to Farlap Chex. Nice bull with great breeding. Will be fertility and trich tested prior to new home. Beautiful young heifer confirmed bred and ready for a new home anytime. Nice body with good temperament. Blount Pasture. Very pretty, feminine female. Comes easily to cubes and an excellent mother. Confirmed now and ready for a new home anytime. Great heifer sired by Aussie Cowboy. Big framed, heavy horned heifer that's safe in calf now and ready for a new home anytime! Productive daughter of the World Champion bull, DRL Son of Sombrah. Very large bodied! Very calm and easy going! Will be confirmed bred at the time she leaves for a new home. Big bodied, big horned Sharp Shooter daughter! Confirmed bred now, ready to go anytime. Very calm and easy going cow. Very marketable breeding! Beautiful black and white cow! Very calm and easy going. She's developing a slow tist in her horns that should be amazing at maturity! She has a small heifer calf at side that's already sold, but Cookie will need to stay here until the baby is weaned. She will be rebred to TKR Tuff Blitz. Beautiful young heifer. Currently with TKR Blitz for her first calf. Very nice young Rip Saw daughter. Confirmed bred now and ready for a new home anytime. Blount Pasture. Beautiful young cow. Very calm and raises an excellent calf. Confirmed bred to WS Elevation at this time. Beautiful young heifer. Being exposed now for her first calf to TKR Tuff Blitz. Very pretty young heifer. Lots of horn breeding. With TKR Tuff Blitz at this time. Very nice young heifer. Good temperament. Easy going and ready for a new home anytime. Beautiful young bull. Would be perfect for a commercial cattlemen to use on young heifers. Beautiful cherry red color. Lots of horn breeding! Beautiful black bull calf! Lots of potential. Very large framed. Should be a nice herd sire or a striking steer prospect. Beautiful young prospect. Lots of horn breeding here. Both parents are over 80"TTT! Love this little bull calf. Look at his pedigree. SERIOUS HORN! Very calm, easy going heifer. Lots of horn breeding here. Love her color! As pretty a bull calf as you'll ever find! Bred for horn, but his color is amazing. Would make a wonderful show prospect! Beautiful little Rocky heifer. Check our her mama! Lots of horn breeding here and by Rocky? You know she'll be great! Beautiful young heifer. Lots of color and great horn breeding. Beautiful young bull prospect. Should be a knock out at maturity with large horn and body! This young heifer should have a TON of horn. Just give her time to mature. She will not disappoint! Beautiful young heifer with a TON of potential. Check out her pedigree. Lots of horn and body! Beautiful young son of Rocky. Thick bodied and look at his mama-twist horn genetics here! Beautiful young heifer with tons of potential! Should be a standout at maturity! Beautiful little blondie! Lots of horn breeding. Excellent young female. Give her time to mature! Beautiful young prospect. Would be great for a show home. Should be awesome! Beautiful young heifer with greats in her pedigree like VJ Tommie! Buy with confidence and know she'll be great at maturity! Beautiful young heifer. Lots of potential. Very friendly! Beautiful breeding on this heifer. Complete package here. Should brindle like her mama in the future. Just give her time to mature! Beautiful young bull. Looks like he'll be tricolor like his mama. Thick bodied and gorgeous. He'll be a standout. Such a sweet young cow. Has a new heifer calf at side. Can go as a pair for $1950. Or, wait until she's confirmed rebred and the calf is weaned and she can go alone.